Whenever the US competes against Sweden in their two annual age-group dual meets, a lot of fellowship is involved. The two squads, locked into training camp together, are united in an endeavor to foster improvement. 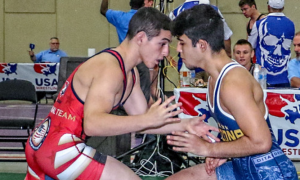 It is a mutually-beneficial cause that breeds friendship and familiarity, and speaks to the unique camaraderie that sets international Greco-Roman wrestling apart from most other sports. But once the whistle blows, any warm feelings which existed prior to battle are quickly put to the side. Be it bragging rights, a desire to impress coaches and teammates, or the innate instinct to strive towards victory the same way a desert wanderer feverishly searches for water — athletes from both teams have their own reasons to do whatever is in their power to grit, gut, and grind out victories. And on this night, the Americans earned more of them. A lot more of them. 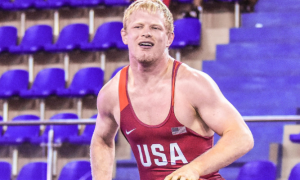 Beginning with 2018 US Cadet World Team member Hunter Lewis‘s (55 kg, WI) brisk destruction of Fabian Frisk and punctuated by big wins from Reese Dalton (71 kg) and Mason Hartshorn (71 kg), Team USA surged past Team Sweden 14-5. 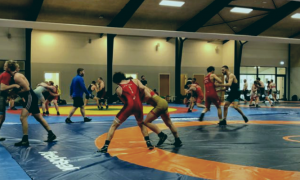 The special 2018 Superior International Camp dual meet took place earlier this evening on the campus of Northern Michigan University and was broadcast live on Facebook. 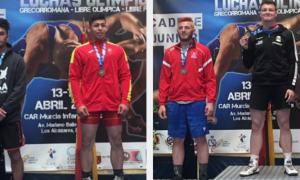 Lewis, who executed two beautiful throws with the second leading to an opening-period pin, was one of three US Cadet World Teamers to earn victories. At 60 kilograms, Phillip Moomey (MWC) looked extremely sharp in taking out Teo Jönsson via 8-0 tech while Dominic Damon (65 kg) was similarly impressive as he torched Max Scharfenort. This wasn’t Damon’s first notable triumph in a USA/Sweden dual. 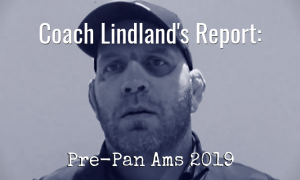 Back in the fall, Damon scored a blitzing tech fall that helped the American squad clinch its first-ever victory over Team Skåne Brottning — the club in which most of the Swedish athletes this week happen to represent. 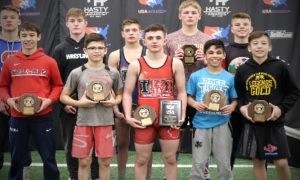 Moving two weight classes was 2018 Junior Greco World Duals champ Hartshorn, but he was no worse for the wear. Hartshorn got on a three-gutwrench run in the first frame against Fabian Mazdin before closing it out in the second to sew up an 11-2 tech. 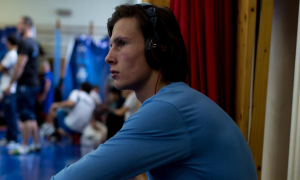 Newly-minted Junior World Team member Alston Nutter, also north of his usual weight class, was briefly challenged by Arvid Westerlund Nilsson when the match began. But following a reset, Nutter blasted a bodylock, pressured-down from top, and secured a pin. The most important win of the night for the US team arrived courtesy of 19-year-old Dalton. 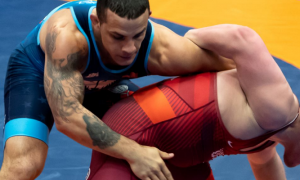 The only American to participate in two matches, Dalton fell in his first bout to Oscar Holmén despite having a moment or two of his own, including a nice bodylock in the second period. Later on in the evening, Dalton and Holmén met again and the result was entirely different. Cranking on a tight left overhook, Dalton straightened up just a little and walloped a devastating headlock with the signal for a fall coming soon after. There are still two more full days of training camp left for the delegations with live matches unfolding throughout both sessions on Friday. Six of Team USA’s victories came via fall. Last year, there were none. Eight of Team USA’s victories ended by tech, meaning all 14 matches won by Americans were sealed prior to the final whistle. United States Greco-Roman Operations Manager Gary Mayabb served as the dual’s referee.